Today's Draw: The Three of Wands from Marcia McCord's Postcard Tarot in the House of the Letter from my Deck of Lenormand Houses. What is happening on the horizon in your life right now? Are the fruits of your labors now in sight? Are you planning on celebrating no matter what happens? Today I'm mixing tarot with Lenormand. Because I'm a troublemaker. 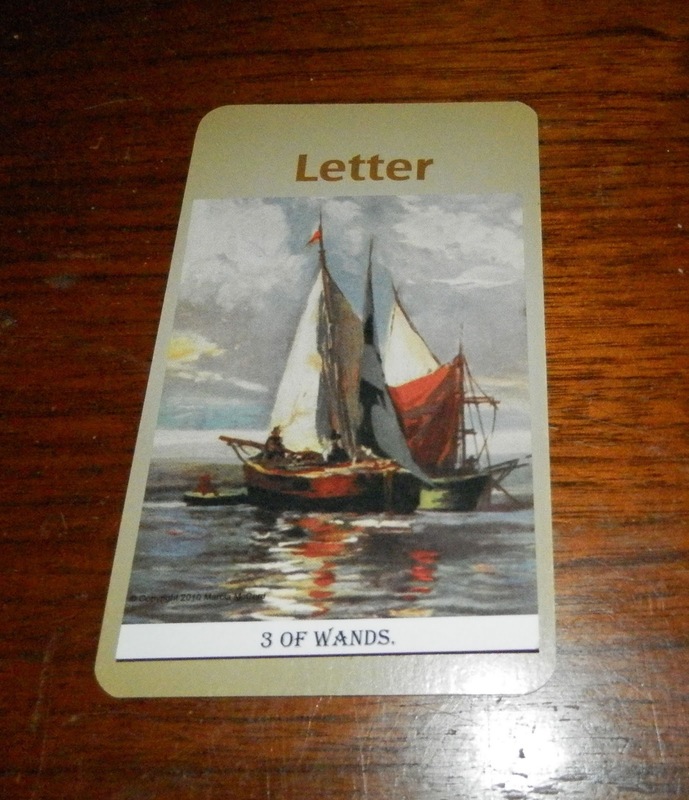 The interesting thing about this particular combo is that Marcia's Three of Wands could easily be The Ship card in Lenormand. If it were, today's message would be about messages coming to us from afar or a message about foreign travel. But it's not a Lenormand card. It's the tarot card about "your ship coming in". So it's about some communication about your ship finally coming in. You've put in your hard work and now all that's left to do is wait while the reward—or consequences—come to you. The message is that the rewards are so close you can almost taste them. For me this speaks about a pitch I'm in on with one of my clients/partners. We're waiting for news about a proposal we put in. And we're all pretty excited about it. I've felt very confident from the get-go about this account. So I'll be surprised if we don't get it. But I have a philosophy about things I want that I don't get—that the reason I didn't get them was because some force was protecting me from some sort of disappointment. So while I'm excited about the prospect of this piece of business for many reasons, including reasons that have more to do with my partner than me, I rarely invest too heavily in outcomes when it comes to my emotions. If it doesn't happen, it's because I dodged a bullet. That's what I believe. So I have something to celebrate, win or lose. Anyway, we spoke earlier this week about planting seeds. And it seems like another seed is sprouting for us out there. We might think it's one thing, but it could actually be something we completely forgot about. And it could just be an element of personal growth. Something recently happened in my life to show me just how much I had grown in some areas. I was falsely accused of something. And, coming from the source it came from, it was very hurtful. In the past, I would have wrung my hands over it and obsessed over it. But instead, I got to the bottom of it (because it involved a situation I had no knowledge of), then once I got a handle on what I was being accused of, I pretty much let it go....surprising even me...haha. While this incident showed me how far I'd come, it also showed me places I have yet to go in regard to worrying about what others think. I'm not 100% there, but one thing I know that I haven't truly known before is that what matters most is who *I* think I am...who I KNOW I am based on my own self knowledge. That's a ship that took a loooong time to come in..haha. So think about your own life. What ship might be coming in now? And could it be some situation in which you've just grown as a person? Regardless, it's important to give ourselves a little "woo hoo!" when stuff like this happens. We don't often see all the hard work in retrospect, but it is truly a moment we made for ourselves from our own valuable effort.